I've totally been crushing over this watch by Daniel Wellington - everything from the quality to the design is absolutely amazing! I always wanted to get a leather strap watch, but just hadn't found one that caught my eye like this one. The one I got is the Classic St Mawes 36mm, which features a classy brown leather band and an elegant rose gold casing. I love how timeless it is, and can be worn as an everyday watch, with just about anything! Daniel Wellington also has a ton of wristband options to choose from to customize your watch. The wristbands are reasonably priced and can easily be switched out. Now until June 16th you can get a complimentary strap when you purchase a watch! Check them out here. *This review was done in collaboration with Daniel Wellington. However, as always all opinions are my own. DW watches are definitely timeless pieces, they are classy and they go with everything! Your top is so pretty! Casual chic perfection! Daniel Wellington watches are amazing and I love the you can swap out the straps. I really need to check out their website. In loovveee with your style from head to toe. You're so simply but so chic! I do love the watch but that top is everything plus more! Ha! Love so much and think I need it in my life. The jeans are super cute as well! Adorable!! I love that watch! That top is gorgeous. DW watches are really nice and I love this casual look on you! Everything is Perfect in you. 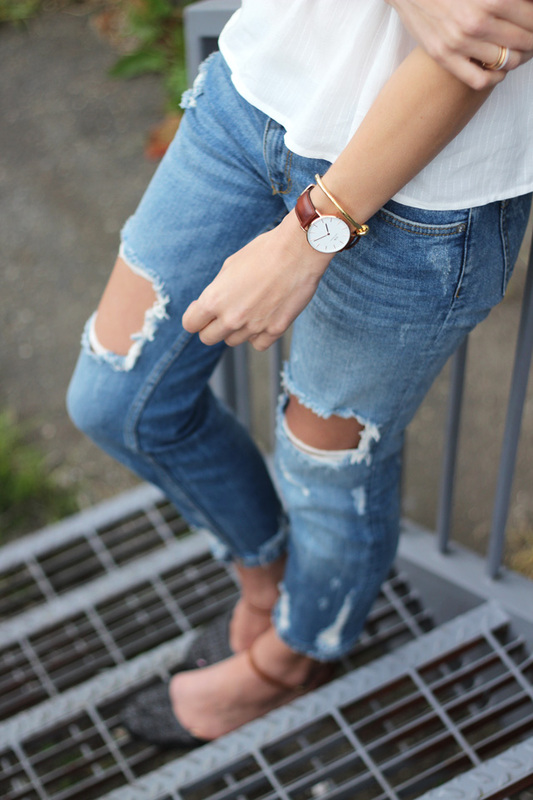 I love Daniel Wellington! Such classic pieces. Your outfit is so great. I need those jeans! Lovely outfit for summer time! Tshirt is so chic! I like this kind of watch, reminds me of olden times watches but with twist and elegance. Your white top is cute too. Your Daniel Wellington watch looks classy. It's a nice accent piece that really brings out the pretty tan leather in your outfit. Your flowy ruffle top is so feminine and goes great with this denim. Such a Lovely Look Ela! very cute i love this outfit and the colours go really well together! Nice look! The jeans look great with the cute top.